Over last ten years or so, breast cancer has been rising steadily and for the first time breast cancer is the most common cancer in women in India, way ahead of cervical cancer. Both the incidence, as well as deaths due to breast cancer are more than cervical cancer. 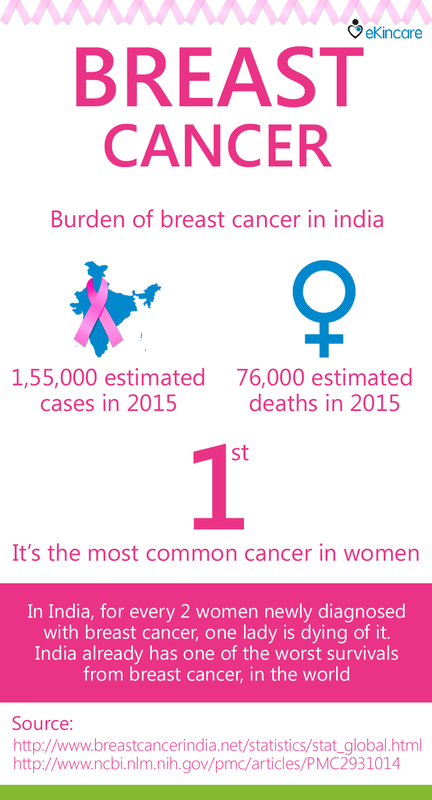 India witnesses one of the lowest survival percentage from breast cancer. This can be attributed to lack of awareness, in most of the cases the women are diagnosed pretty late. With early detection it can be treated adequately. There are no definite causes of breast cancer, however there are certain risk factors. Please note that having one or several of these factors doesn’t necessarily mean that one would develop breast cancer. Many women who develop breast cancer have no known risk factors other than simply being Women. Being a women- Although men and women both are susceptible. Breast cancer cases in men are rare. Women are much more likely than men are to develop breast cancer. Increasing age- With age the risk of breast cancer increases. A personal history of breast cancer- If you’ve had breast cancer in one breast, you have an increased risk of developing cancer in the other breast. A family history of breast cancer- If your mother, sister or daughter was diagnosed with breast cancer, particularly at a young age, your risk of breast cancer is increased. Still, the majority of people diagnosed with breast cancer have no family history of the disease. Inherited genes that increase cancer risk- Certain gene mutations that increase the risk of breast cancer can be passed from parents to children. Radiation exposure- If you received radiation treatments to your chest as a child or young adult, your risk of breast cancer is increased. Beginning your period at a younger age- Beginning your period before age 12 increases your risk of breast cancer. Beginning menopause at an older age- If you began menopause at an older age, you’re more likely to develop breast cancer. Having your first child at an older age- Women who give birth to their first child after age 35 may have an increased risk of breast cancer. Having never been pregnant- Women who have never been pregnant have a greater risk of breast cancer than do women who have had one or more pregnancies. Postmenopausal hormone therapy- Women who take hormone therapy medications that combine estrogen and progesterone to treat the signs and symptoms of menopause, have an increased risk of breast cancer. The risk of breast cancer decreases when women stop taking these medications. Drinking alcohol- Drinking alcohol increases the risk of breast cancer. October is the Breast Cancer Awareness month, there is no prevention for Breast cancer. Your best chance is to detect it early, so get yourself checked regularly. Assess, track and stay informed about your Health with eKincare.